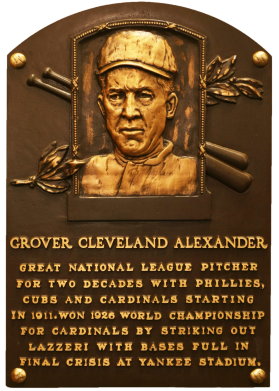 Despite battles against alcohol and epilepsy, Alexander's 373 wins is tied for the National League record. While pitching with Philadelphia in 1916, he recorded a major league record 16 shutouts on his way to a 33-12 record. "Pete" led the senior loop in wins six times, ERA five times, and shutouts seven times. His 90 shutouts are second on the all-time list. 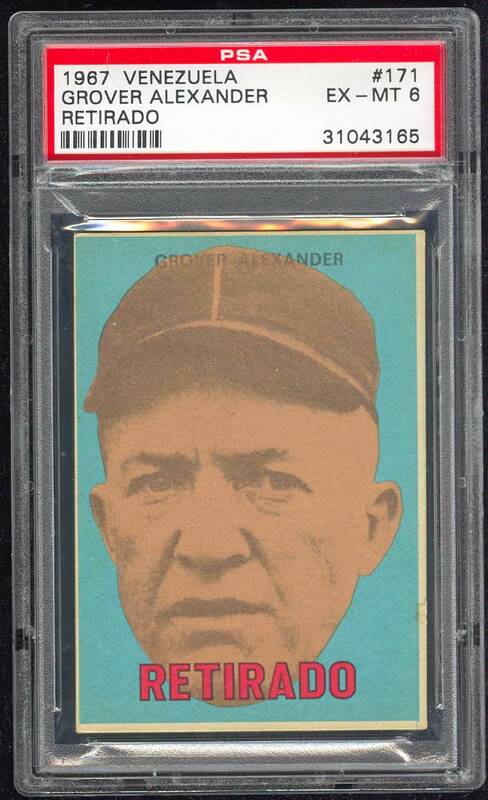 Comments: In May of 2000, I purchased a group of 1960 Fleer PSA 8s from Vintage Sports Investments via their website - G. Alexander, H. Heilmann, H. Jennings, H. Newhouser, W. Hoyt and E. Collins. They were temporary placeholders until I found a contemporary portrait card issued during their careers. In Alexanders case I didnt find one but I really liked this 1967 Venezuelan issue. It's the highest graded example to date - nice! This card was purchased raw for $60 at The National (Cleveland) in 2004 and graded by PSA in March, 2005. Although it's not contemporary to Alexander's career, I consider it one of my all-time great finds. It was an upgrade for me. I owned a PSA 4 (purchased in April, 2002) . 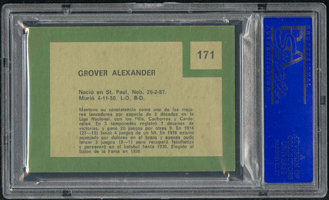 Description: Three distinct series of baseball cards were issued in 1967 for sale in Venezuela, contiguously numbered. Cards #139-188 are former big league stars. 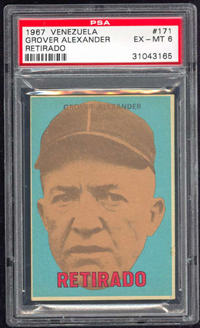 The fronts of the roughly 2-1/2" X 3-1/2" Retirado cards have a blue background with the player's name in black at top and "RETIRADO" in red block letters at bottom. Player photos on the Retirado cards are sepia. Horizontal backs are printed in black on green with bits of personal data and a career summary. Like most of the Venezuelan cards of the era, these are crudely printed on cheap cardboard. 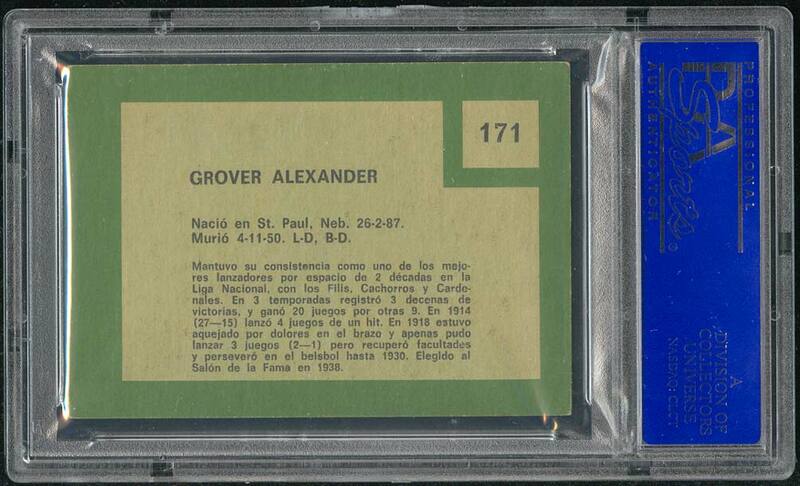 Also like most Venezuelan cards, they are virtually impossible to find in any condition above EX. Many are found with back damage due to having been glued into an album or scrapbook.